Only 20,918 refugees have so far been admitted to the US in fiscal year 2018, despite the cap being set at 45,000. 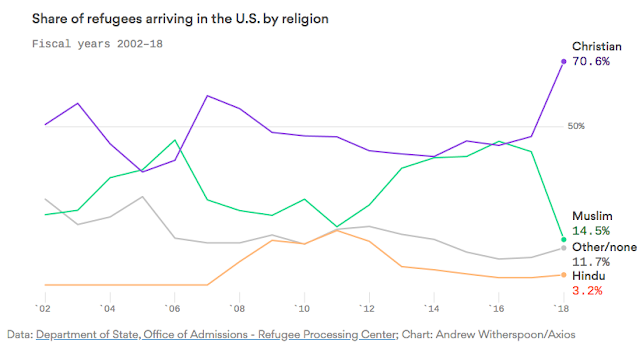 Of those admitted, Muslim refugees have been hit the hardest with their share dropping to 14.5%, the lowest since 2001. At the same time, the Christian refugees share rose to nearly 71%, the highest since 2001, according to data compiled by United Nations High Commission for Refugees (UNHCR). This data provides incontrovertible evidence of U.S. President Donald J. Trump's Islamophobia and xenophobia. Turkey is the largest and Pakistan is the second largest host country for refugees worldwide. Turkey has nearly 3.5 million refugees mostly from Syria. Pakistan has 1.4 million refugees mainly of Afghan origin. 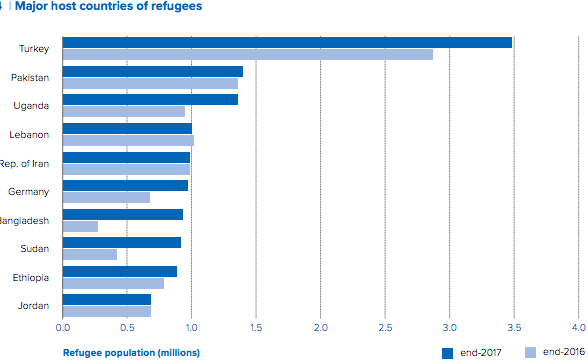 Germany is the only western country that shows up among the top 10 host countries for refugees. Most of the rest are Muslim majority countries. Myanmar: A majority of Muslim refugees accepted into the U.S. in FY 2018 have come from Myanmar, where thousands of Muslim-majority Rohingya have been killed in an ethnic cleansing and hundreds of thousands have fled. Somalia: The number of refugees admitted from the Muslim-majority, African nation of Somalia has dropped by 96% compared to last fiscal year. For no known reasons, the White House expressed particular concern over allowing refugees from Somalia into the U.S., former chief of the refugee affairs division at USCIS Barbara Stack told Zoe Chace in the latest episode of This American Life. The year of Islamophobia began in earnest on January 20, 2017 with the inauguration of President Donald J. Trump who called for "total and complete shutdown" of Muslims entering the United States during his successful electoral campaign. Among the first executive orders he signed was a "Muslim Ban" from seven predominantly Muslim countries. Then came an avalanche of a large number of Islamophobic tweets and retweets from Trump's twitter account. Some recent Trump retweets were of tweets from Britain First's Jayda Fransen. These tweets and retweets were swiftly denounced by top British and Dutch officials. Trump did not apologize. Trump developed a pattern of using terror attacks to tweet against Muslims while ignoring similar or worse terror attacks by others. Trump closed the year with recognition of Jerusalem as Israel's capital, a recognition that prior US administrations had withheld pending negotiations and final settlement of the issues between Israelis and Palestinians. Only 20,918 refugees have so far been admitted to the U.S., despite the cap being set at 45,000 for fiscal year 2018. Of those admitted, Muslim refugees have been hit the hardest with their share dropping to 14.5% while the Christian refugees share rose to nearly 71%, according to data compiled by United Nations High Commission for Refugees (UNHCR). This data provides incontrovertible evidence of U.S. President Donald J. Trump's Islamophobia and xenophobia. The simultaneous rise of Neo Nazis in the West and the Hindu Nazis in India represents a very serious and growing threat to world peace. Their combined menace can lead to further global instability and increased violence if these trends are not halted and reversed soon. I hope good sense prevails among the voters in these countries to pull the world back from the brink of human catastrophe.